Initial analysis and assessment of needs for both local landscape and people. Draw up a plan to fulfill these needs, covering the development of: initial earthworks, building design and materials, energy systems, waste systems and agricultural production. Each project would incorporate a classroom, accommodation and catering facilities for regional and international students and interns, administration office, soil testing equipment, nursery and tools. Each project would have a three-year phased development timescale for completion, culminating in an established working demonstration site and education centre - managed and run by local labour. Project students and interns will be monitored by project leaders, with a view to their being offered positions for project replication in new areas. How to work with local legal systems to set up non-profit organisations so as to receive funding and sponsorships. How to set up local community groups, education systems, farm management systems, administration systems - all the elements needed for a new project. Cultural and historic analysis of sites. We teach as you learn by working with us on real jobs. You will sleep well. Nadia Lawton was born and raised in the Jordan Valley, in one of the lowest and driest places on earth. She completed her PDC with Geoff Lawton in Jordan and went on to complete a Permaculture Diploma in Education and Site Design. She regularly travels with her husband for aid project and permaculture consulting work, and assists in teaching permaculture design courses. 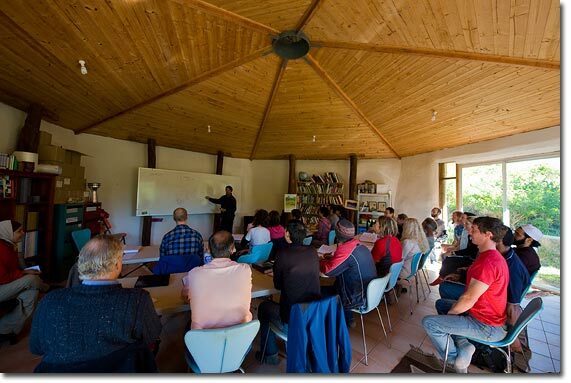 Lesley Byrne is an international permaculture educator and currently co-teaches the Permaculture International Aid Workers Course, Training Teachers Course, and the 10 week internship with Geoff Lawton at PRI Australia. With an extensive academic background, including two graduate degrees in international education, environmental history and multicultural societies in the Caribbean and Latin America; Lesley brings a wealth of experience of teaching at both the university and lower grade levels both abroad and in the U.S.
Lesley completed her PDC in Jordan with Geoff and Nadia Lawton. Currently, Lesley is based between the U.S., Australia, Jordan, and Afghanistan. Since 2005, she has been directly involved with permaculture aid development and designing and installing educational school gardens with an emphasis on permaculture, sustainability, community outreach workshops for widows, orphans and girls. Ms. Byrne is the founder and executive director of Kids Are Sweet International, a U.S. nonprofit, whose mission is to help the most impoverished families and children in rural areas of the world, with a specific emphasis on permaculture and sustainable development. All prices are in Australian dollars. The fee for the course is $1,100, including GST, and including meals. A non-refundable $300 deposit is required at the time of the booking. The balance of $800 is due 21 days prior to the course start date. An early bird discount of 10% is available if the course fee is paid 42 days prior to the course start date. How to Pay: You can pay via Paypal, credit card, direct bank deposit or cheque. Click here for details. Information on directions, accommodation/facilities and Visas can be found here. Please Note: For this particular course, classes are 9am to 5pm, Monday to Friday. Camping is provided from Saturday night to the following Saturday morning if you like - only because we don't do pick ups on Sundays.